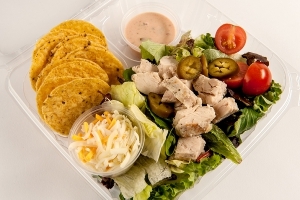 Place 9-10 tortilla chips around edge of salad. Heat grilled chicken strips according to package directions. Place 2 ounces of cooked chicken strips in center of mixed greens. Portion 1 salad for each serving. Each portion provides 2½ oz. eq. meat/meat alternate, 1 oz. eq. whole grain, ½ cup dark green vegetable, 1/8 cup red/orange vegetable and ½ cup other vegetable. Use commodity products when available. Commodity grilled chicken strips have a different yield than purchased chicken strips, so nutrition analysis will need to be re-calcuated if the purchased chicken is used. See recipe MRS 604 for a recipe using purchased fajita chicken.